Our Engraved Bubble Hi Ball Glass with Diamonds design is an ideal gift for those who like a drink and the glass can be personalised, making it perfect for all occasions. 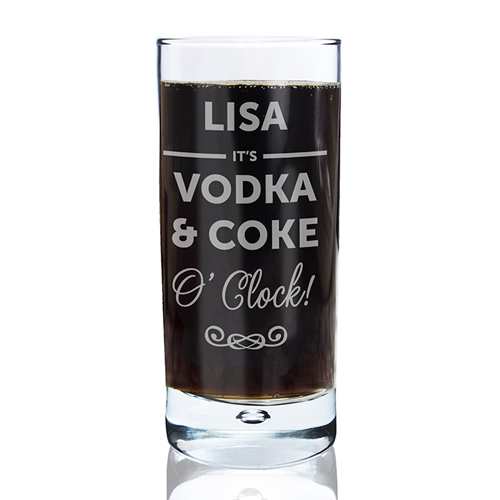 O'clock Hi Ball Glass is the perfect gift for any occasion. Personalise with a name and two lines of up to 12 characters. 'It's' and 'O'clock' will be fixed text on this item. Lines 2 and 3 can be a beverage of your choice i.e. Vodka & Coke. The personalisation will be capitalised. Personalise with a name and two lines of up to 12 characters.